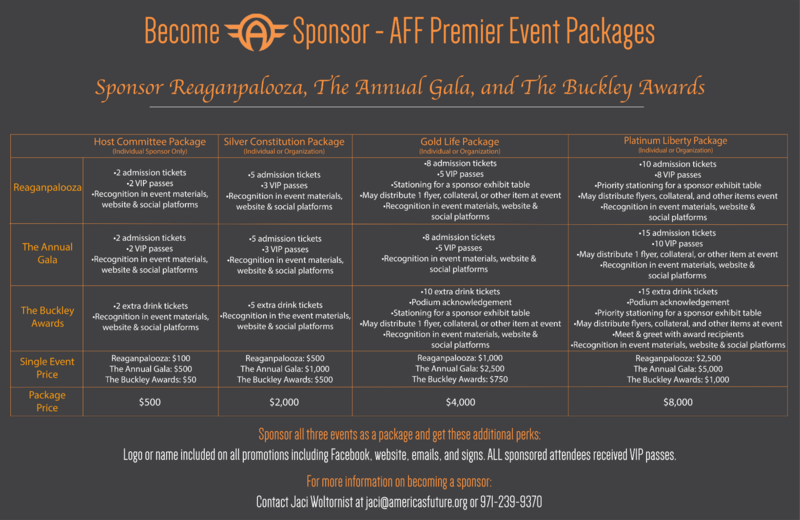 Promote liberty among young professionals by becoming a sponsor of AFF’s premier annual events, held in Washington, DC. Sponsor each event individually or all three as a package. Events can be sponsored at one of four levels: Host Committee (open to individuals only), Silver (open to both individuals and organizations), Gold (open to both individuals and organizations), and Platinum (open to both individuals and organizations). The graph below outlines the benefits included at each level of sponsorship. Sponsor all three events as a package and receive extra perks, and, at some levels, a discounted sponsorship rate. For more information or to become a sponsor, please contact Jaci Woltornist at [email protected] or 971-239-9370. This networking event brings together like-minded friends and allies to celebrate the liberty movement and the monumental presidency and legacy of Ronald Reagan, held during the annual CPAC gathering. A formal night of networking, drinks, and hors d’oeuvres. The Buckley Awards, given in honor of William F. Buckley, Jr., recognize outstanding young professionals for their above-and-beyond service to the movement.